This was a significant step forward in our ongoing pension campaign. We continue to campaign on various fronts to challenge detrimental pension changes and to win improvements to pensions for FBU members. We are the only organisation doing so. The next steps in the legal process involve the government exercising the option to appeal and is explained briefly below. As with all legal challenges, timescales are always dependent on potential appeals, hearings etc. and are largely beyond our control. It is important to note also that legal processes of this nature are generally slow. We shall continue to issue information as soon as possible but will always seek to ensure that such information is correct, which often means the need for detailed discussions with lawyers before publication. 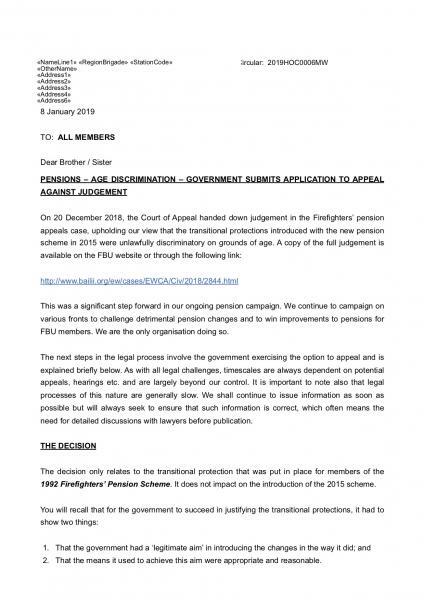 The decision only relates to the transitional protection that was put in place for members of the1992 Firefighters’ Pension Scheme. It does not impact on the introduction of the 2015 scheme. That the means it used to achieve this aim were appropriate and reasonable. Since we won on the first question, the court said it did not need to go into the second consideration. The next step is to remit the case to the Employment Tribunal to consider a remedy to this situation. However, before that step, the government can seek permission to appeal to the Supreme Court. There is not an automatic right of appeal. It must be made via an application process. I can confirm that the government has already submitted an application to appeal. We will now have to wait to see if this application is successful. We expect this decision in the near future, and members will be informed of any developments. This means that any remedy hearing at the Employment Tribunal will not take place until all the issues around the appeals are resolved. Only when we have the information in relation to the appeal will we be able to provide more detail on the next steps. However, we have already started discussing potential scenarios with our legal team and will be well prepared for the next part of this ongoing challenge. We are aware that some members have contacted local pension administrators about the outcome. Currently, they will be unable to provide any detailed response and will continue to deal with pensions in line with current regulations which have not yet been changed. Obviously, since the announcement of this decision, FBU members want to understand what this means for their pension. As expected, we have received a number of questions in relation to this decision. These are not being ignored, but please recognise that we are unable at present to provide this information which will have to be discussed as part of our remedy negotiations and as the issues around a potential appeal become clearer. For example, some members of the 2006 scheme have been asking how, if at all, it impacts on them. For these members, it is important to note that we did not raise a challenge related to the 2006 scheme. We only challenged on behalf of members of the 1992 scheme who were not fully protected. Further details will be made available to you as they emerge and you should keep an eye on the FBU website and other information sources. Specific questions or concerns should be raised through your local officials in the first instance.